Age 14/15? | 1982/83? Cor…. nice drawing in this one! I must have been secretly doing new pages as an older teenager—without telling my cool heavy metal school pals, for fear of ridicule. Surely I was at least 14 or 15 when I did this? It’s very hard to say. When I was working from visual references I could do pretty good stuff even when I was 12 or 13. Do any of you ever think that Vader’s meditation chamber looks a bit like a giant Halloween pumpkin? 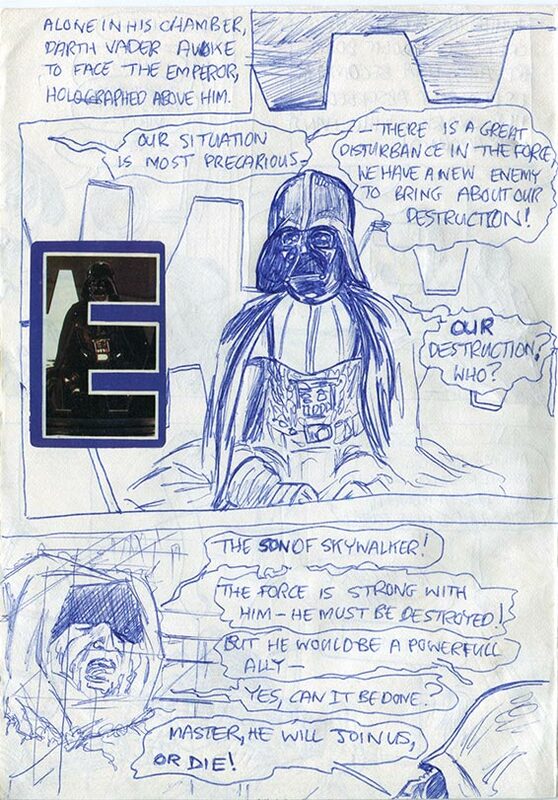 In my version I don’t seem to had Vader bother himself to go to a special room to speak with the Emperor’s hologram. Or bow down in obeisance. Nah, he just stays where he is, like a teenage in bed on his mobile phone, and waits for the Emperor to come to him. That’s the way to stick it to the boss! Yep, after a few weeks of determined work, the new WordPress-based website is up and crammed to the rafters with stuff to see. I’m hoping to drum up some business with it and get back to doing the kind of work that I love—full-time. Share—share like the wind! And help an artist out for free.